It's a little like finding Waldo. Can you find Laminex's Patty Moran Lee in this video? Using a card printer? Which one? Here's an anonymous (we promise!) poll for all the readers out there that use card printers every day. Respond and you just might see how many folks are using the same kind of printer as you. From the Wall Street Journal -Sens. Charles Schumer (D-N.Y.) and Lindsey Graham (R-S.C.) have introduced an immigration reform bill that creates a system that aims to preventing U.S. companies from hiring illegal immigrants. Under the system, all legal U.S. workers would be issued an ID card embedded with biometric information like fingerprints or scans of the veins in the tops of their hands. When workers go to apply for a job, the cards would be scanned by the employer using a $700-$800 machine. Small employers unable to afford the cost of the scanners could instead choose to take applicants to a government office to have their hands scanned, Schumer said. Schumer and Graham's plan calls for the cards to be phased in. Workers who have jobs now would not be required to obtain the card until they leave their current position. In addition, industries that typically rely on illegal workers would be required to check the cards first, with other industries to follow later. The system is being criticized by privacy advocates like the American Civil Liberties Union, which says that the cards could become national ID cards that the government could use to track citizens. However, Graham says that the system would simply make current forms of identification, such as Social Security cards, tamper-proof. We say: A few years ago some people thought biometric technology would replace ID cards. At that time we thought physical verification would not go away. This has become evident with the increased use of multi-technology cards. When you work with great folks giving testimonials is a piece of cake! You can view our catalogs at their site or at our CredentialExpress site. Custom Badge Holders? No problem. Check out this sweet combo of printed lanyard, custom 4 color matte/gloss finish fold-over insert shaped like an iPhone, and a custom size & printed badge holder with zip lock pocket on back for your stash. We get jazzed working on these type projects. How about you? 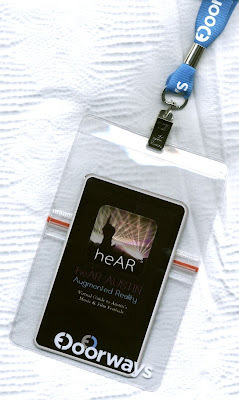 Note: The insert looks small in the pocket because the badge holder is sized to allow an actual iPhone to be inserted when the software app is used at the SXSW 2010 event.